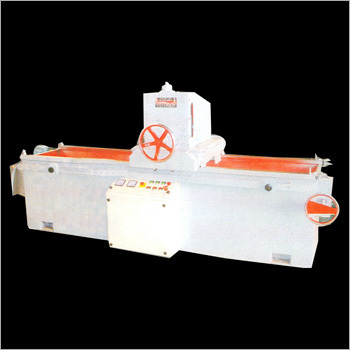 We are counted among the most leading automatic knife grinding machine manufacturers and suppliers, based in India. In the manufacturing of the Knife Grinding Machine, we utilize excellent quality materials that further ensure high durability and resistivity to various corrosive attacks. Moreover, due to the unmatched quality and unbeatable performance, knife grinder machine has become ideal in the global market for the respective applications. Customers are also facilitated with the delivery of the knife grinding machine with the stipulated time frame and at the most reasonable prices. We offer our clients with a qualitative range of Knife Grinder Machines. These are ideal for grinding the knife of veneer lather machines. Our range is available in the models 56" and 108" with extra heavy duty MS fabricated body. The slides of our machine are made from quality cast iron and have a knife holder for facilitating accurate working with quality sharpening of blades. Our range is fitted with superior quality electrical panel and is accurate, which has made these Knife Grinder Machines more demanding in the international market. Looking for “Knife Grinding Machine”?